After four weeks of the season, nine teams remain unbeaten in 8-Man, Division II. But the defending state champions and favorites to win a second consecutive title are not one of them. Baileyville B&B opened the season against Madison, the top-ranked team in Division I, for the second consecutive season. This year, B&B dropped a heartbreaker 29-28 in overtime. Much has been made about this final season of B&B Falcon football. The school will consolidate with Nemaha Valley next year to form Nemaha Central. The Falcons have played in five consecutive state championship games and won three of them. They would like nothing more than to end with another title in their final year. Twin Valley League rival and fellow District 1 member Hanover is unbeaten and ranked second in Division II. Sharon Springs-Wallace County is ranked third in the state behind a stout defense that has posted three shutouts. We’ll know a lot more after this week when Wallace County faces Hanover in a match-up of No. 2 versus No. 3 in the state. Victoria looks to be another challenger on the western half of the bracket behind an offense that is averaging 55 points per game. Finally, Thunder Ridge was upset by Beloit St. John’s-Tipton 42-38 last week. The Longhorns have reached the Division II state title game in each of the past two seasons, but now must likely win out to reach the playoffs again. Blue Valley Randolph (4-0, 0-0 district) – The Rams are unbeaten, but their wins have come against opponents that are a combined 4-12. A fifth win by Blue Valley Randolph would be their most in a season since 2006, which is the last time the Rams made the playoffs. Hanover (3-0, 0-0 district) – The second-ranked Wildcats have a difficult schedule the rest of the way as their next five opponents are a combined 15-4. Kent Bruna leads Hanover with 251 rushing yards and seven touchdowns this season. Quarterback Andrew Bruna has passed for more than 300 yards and five touchdowns. Baileyville B&B (3-1, 0-0 district) – After falling in overtime to Division I’s top-ranked Madison, the Falcons have rolled to three wins by a combined score of 170-26. The wins have come against traditionally solid programs in Quinter, Pretty Prairie, and Caldwell. Baileyville eliminated Caldwell in the second-round of the playoffs a year ago. Dustin Rottinghaus leads a Falcon offense with 723 passing yards and 13 touchdowns. B&B’s passing attack has accounted for nearly 67 percent of their total offense this season. Axtell (3-1, 0-0 district) – The Eagles have been impressive this season, losing only to powerful Sacred Heart (Fall City, Neb.). Derek Porting leads Axtell’s offense with 239 rushing yards and four scores. Eagle quarterback Tyler Jones has passed for 186 yards and four touchdowns to provide balance. Axtell is a solid team but will have to pull an upset in a strong district to make the playoffs for the first time since 2008. Frankfort (1-3, 0-0 district) – Frankfort will begin district play coming off of a bye week in Week 4. The Wildcats are led on offense by backs Lucas Adams and Jake Rose (382 yards, 6TDs). Frankfort will open district play at Blue Valley Randolph this week. Key games: (Wk 5) Baileyville B&B at Axtell; (Wk 6) Axtell at Hanover; (Wk 8) Baileyville B&B at Hanover. Hope (3-1, 2-0 district) – Hope lost 36-34 to Solomon in Week 1, but then pulled off 60-36, 50-0 and 54-6 victories. The Lions, a longtime power under veteran coach Jeff Hostetter, went 5-4 last season. Hope has posted double digit wins in five seasons from 2004-11. Southern Cloud (3-1, 2-0 district) – Southern Cloud hasn’t made the playoffs since 2002 and has four postseason appearances in school history. However, the Warriors have a good opportunity this season. Southern Cloud is 0-1 at home, but 3-0 on the road. The Warriors defeated Frankfort, 30-22, lost to St. John’s-Tipton, 60-14, and then beat Goessel, 54-6, and Chase, 44-6. Southern Cloud has passed for 130 yards a game and rushed for 132 yards a game. Senior quarterback Ryan Perkins has completed 32 of 54 passes for 521 yards with a 9/0 TD/INT ratio. Tescott (2-2, 1-0 district) – Tescott is on pace to enjoy its best season since a 6-3 record in 2008. In the last four years, Tescott went 1-8, 0-8, 2-7 and 1-8. This year, Tescott lost to two solid programs in Logan-Palco (44-6), Natoma (69-36), and defeated Burrton (54-8) and Wilson (44-24). Goessel (1-3, 1-1 district) – Second-year coach Garrett Hiebert took over a Goessel program in 2011 that was coming off a 1-8 year. Last season, the Bluebirds went 6-4 and are off to a 1-3 start this season. Goessel’s lone victory was a 46-26 victory against Burrton in Week 4. White City (0-4, 0-1 district) – White City has lost all but one game by at least 32 points. The Huskies are 0-3 at home and 0-1 on the road. White City went 2-7 last year and hasn’t made the postseason since 2004. Chase (1-3, 0-2 district) -- Chase had made the playoffs three straight seasons, but that run could come to an end for the Kats this year. Chase lost to Wilson 62-42, beat Lakeside 28-12 and then lost the last two contests by a combined score of 94-6. Burrton (0-4, 0-2 district) – Burrton went 0-9 last season and hasn’t posted a victory since a 52-7 victory against Attica in Week 4 of the 2011 season. Burrton tallied just eight points in its first three games, but responded with a 28-point effort in an 18-point loss to Goessel last week. Key games: Hope at Southern Cloud on Oct. 11 will likely decide both spots. Chetopa (4-0, 0-0 district) – Chetopa has rolled to a 4-0 start behind an offense that has averaged 62 points per game. Junior Derrick Cassell (6-1, 195) has rushed for 634 yards and 14 touchdowns and is one of the state’s best. QB Phillip Moses gives the Green Hornets balance having thrown for more than 850 yards and 14 scores. His main target is Austen Sanders who has 550 receiving yards and 11 touchdowns. Chetopa gets a big test this week in a non-district game against Madison. Waverly (3-1, 0-0 district) – Waverly opened the season with three consecutive wins before being shut out by Marais des Cygnes Valley 50-0 a week ago. Austin Bailey leads the Bulldogs’ offense with more than 500 yards and 10 touchdowns. Waverly hopes to end a streak of five consecutive first-round playoff losses. Colony-Crest (2-2, 0-0 district) – Life without Kyle Hammond has proven difficult thus far for the Lancers. Still, Crest is 2-2 but those two wins have come against a pair of programs struggling this year in St. Paul and Marmaton Valley. Southern Coffey County (1-3, 0-0 district) – The Titans picked up their first win of the season last week in beating Pleasanton 28-22. They should carry that momentum in to their district opener with Elk Valley, but a playoff appearance for the first time since 2007 isn’t likely. Elk Valley (0-3, 0-0 district) – By our records, the Lions haven’t won a varsity game since the 2007 season. Elk Valley has been outscored by an average of 60-11 in their three games this year. Altoona-Midway – Competing with a junior varsity schedule only this season. 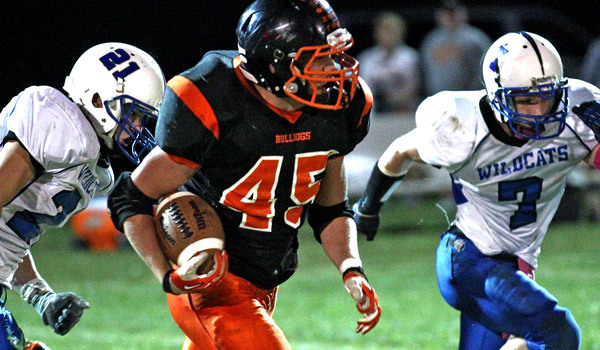 Key games: (Wk 8) Chetopa at Waverly should decide both playoff spots. Caldwell (2-2, 1-0 district) – The Blue Jays are 2-2, but their only two losses are to 8-Man Division II’s top-ranked team Baileyville B&B and 3-1 Udall. Colten Ward took over for injured quarterback Darin Ward and passed for 69 yards and two touchdowns while rushing for 95 yards and a touchdown during a 53-8 win over Cunningham in Week 3. The Blue Jays will look to get back in the playoffs after advancing to the second round last year, but have already experienced several injuries this season. South Barber (2-2, 1-0 district) – The Chieftains’ two losses are to 3-1 South Haven and Oklahoma’s Shattuck. South Barber junior quarterback Peyton Yandel has passed for 573 yards and seven touchdowns while rushing for 576 yards and 11 touchdowns. Junior Dylan Allison leads the Chieftains defense with more than 17 tackles per game. South Barber lost in the first round of the 2012 playoffs. Argonia-Attica (3-1, 1-0 district) – The newly formed football Titans have won three straight games after falling 30-12 to Udall in the season opener. Quarterback Alec McDaniel has passed for 448 yards and eight touchdowns while rushing for 313 yards and five touchdowns. Because they co-oped during a two-year cycle, A&A is not eligible for the postseason. Stafford (2-2, 0-1 district) – The Trojans’ losses are to district foe South Barber and Central Plains. Ethan Johnson rushed for 126 yards and three touchdowns in this past week’s loss to South Barber. Despite having a 6-3 record last year, the Trojans haven’t made the playoffs in recent history. Norwich (0-4, 0-1 district) – The Eagles are 0-4, but three of the losses were by 16 points or fewer. Sophomore quarterback Jacob Norris has passed for 884 yards and 13 touchdowns, while rushing for 516 yards and eight touchdowns. Senior Lucas Lohrman has 24 receptions for 496 yards and 10 touchdowns. Norwich has not made the playoffs since 2008. Cunningham (0-4, 0-1 district) – The Wildcats have lost all four games by 22 points or more. Sophomore Jacob Early rushed for 152 yards against Skyline. Cunningham hasn’t made the playoffs since 2008. Key Games: (Wk 6) South Barber will be on the road against Caldwell in a game that could decide the district champion. Beloit St. John’s-Tipton (4-0, 2-0 district) - SJ-Tipton pulled off one of the biggest results of the season with a 42-38 victory against Thunder Ridge last week. Thunder Ridge had been 27-2 in its last 29 games and hadn’t lost a district contest since Week 7 of 2009. The Blujays have a fairly even offense with 134 passing and 232 rushing yards per contest. Senior Connor Eilert leads SJ-Tipton with 42 carries for 318 yards and eight scores, while junior Trey Dubbert has completed 28 of 43 passes for 426 yards and a 10/2 TD/INT ratio. Natoma (4-0, 1-0 district) - The Tigers have enjoyed its best start since 2003 and could earn their first playoff berth since a 7-3 record in 2007. Natoma defeated Sylvan-Lucas 17-12 in a game that came down to the final play. Then, the Tigers defeated Tescott 69-36, Wilson 55-6 and Stockton 53-6. Senior Jackson Stull Meiers has 51 carries for 568 yards and six TDs, while senior Cale Hooper has 37 carries for 381 yards and six scores. Overall, Meiers has 821 all-purpose yards, has 12 total touchdowns and nine kick points. Thunder Ridge (3-1, 1-1 district) – The Longhorns won the state championship two years ago and earned runner-up honors last season. Thunder Ridge has averaged 355 rushing yards per game. Junior Trent Rietzke paces the Longhorns with 55 carries for 543 yards and 11 scores. Logan-Palco (2-2, 1-1 district) - Logan-Palco is a co-operative agreement between Logan and Palco, two Eight-Man, Division II schools. Because they co-oped during a cycle, Logan-Palco is not eligible for the postseason. However, the Trojans have put together a strong season, including a 66-40 victory against Northern Valley last week. Northern Valley (2-2, 0-1 district) – Northern Valley finished 7-2 last season and this year was one of high expectations. The Huskies have still ran the ball very well – 316 yards per game – but lost in Week 1 to Alma, Neb. and then lost last week to Logan-Palco. Senior quarterback Hunter Chandler completed 16 of 33 passes for 274 yards with a 5/0 TD/INT ratio. The top three rushers have between 355 and 420 yards. Stockton (1-3, 0-2 district) - Opponents have outscored the Tigers 179-78. Stockton defeated Hill City 30-24 in the first week and then has progressively lost by bigger margins – 26, 34 and 47 points. Key Games: All contests between SJ-Beloit, Thunder Ridge, Natoma and Northern Valley are crucial in a close district race. Sharon Springs-Wallace Co. (4-0, 2-0 district) – Wallace County has three shutouts around a 36-28 Week 2 victory against Hoxie. Senior quarterback Kyle Gfeller has completed 12 of 17 passes for 143 yards with two scores and has rushed 45 times for 253 yards and nine TDs. The Wildcats have made the playoffs all seven years under coach Kevin Ayers. Weskan (3-0, 1-0 district) – Weskan was one of the only Kansas teams to have a bye in Week 1. Since then, the Coyotes have remained undefeated, including a quality Week 3 victory against Logan-Palco. Weskan is 11-2 in the past two seasons. Weskan has outscored opponents 136-42. Senior quarterback Hayden Walker has completed 19 of 40 passes for 311 yards and a 3/0 TD/INT ratio. He has also rushed 67 times for 464 yards and nine scores. Tribune-Greeley County (1-3, 1-0 district) – Greeley County has suffered three losses by at least 38 points, but did defeat Rexford-Golden Plains, 66-24, in Week 3. Senior Ethan Stone has passed for 258 yards, rushed for 400 yards and accounted for 10 scores. Cheylin (1-3, 1-1 district) – Cheylin has posted three seasons of .500-plus records, but could have a hard time matching that this season. Former assistant Anthony Blair, in his first season as head coach, led the Cougars to a 66-32 victory against Wheatland-Grinnell in Week 3. Triplains-Brewster (2-2, 0-1 district) - Triplains-Brewster has continued to improve under second-year coach Tony Stramel and has already matched last season’s win total. The Titans defeated Western Plains 44-0 in Week 1 and then beat Wheatland-Grinnell, 44-12, last Friday. Triplains-Brewster suffered its two losses by a combined score of 109-22. Wheatland-Grinnell (0-4, 0-1 district) – The Thunderhawks have just 11 players on their roster and have lost every game by at least 28 points. Junior Dominic Zimmerman has passed for 223 yards and rushed for 128 yards. Golden Plains (1-3, 0-2 district) – Opponents have outscored Golden Plains 204-82. The Bulldogs’ lone victory is a 44-42 win against Western Plains in Week 2. Key Games: Wallace County is the class of the district. Triplains-Brewster at Weskan this Friday will likely decide the runner-up spot. Victoria (4-0, 0-0 district) — Victoria has been nearly unstoppable with its veteran offense, paced by senior quarterback Sam Ottley. The Knights have outscored opponents 220-80 and rank second in Eight-Man, Division II in scoring offense. The Knights have reached the playoffs 11 straight years, the longest current streak in eight-man football. Dighton (2-2, 0-0 district) — Dighton, with just a 12-player roster, has suffered big losses to quality teams in Wallace County and Hoxie, but also has two victories, including a 24-22 Week 3 win at Quinter. Senior Issac Alinor leads the Hornets with 63 carries for 286 yards and 636 total yards. Wilson (1-3, 0-0 district) - Wilson, long known for a prolific offense, defeated Chase 62-42 in Week 1. Then, the Dragons lost three in a row, all by at least 20 points. Otis-Bison (0-4, 0-0 district) - Otis-Bison was 40-6 the last four seasons, but this was expected to be a down year. The Cougars have started winless, but quarterback/safety Kole Urban has rushed for 420 yards with six scores and with 29 tackles and a team-high two interceptions. Sylvan-Lucas Unified (0-4, 0-0 district) - Sylvan-Lucas has played the No. 2-hardest schedule in Eight-Man, Division II. Three of the Mustangs’ opponents are 4-0. Sylvan-Lucas has lost two games by a combined 15 points. Western Plains (0-4, 0-0 district) - Western Plains suffered a big loss when all-purpose threat Juan Mendez, a state placer in the Class 1A triple jump last spring, suffered a severe back injury in early fall. Mendez is likely out for all of basketball season, too. Opponents have outscored the Bobcats 205-92. Rolla (4-0, 0-0 district) — Rolla, the district runner-up to Fowler last year, outscored opponents 150-54 en route to an undefeated start. Senior quarterback Kyler Telford has rushed 64 times for 736 yards and 13 TDs. Ingalls (3-1, 0-0 district) — Ingalls has opened 3-1, but has actually been outscored 136-124. The Bulldogs defeated South Gray, 34-30, lost to Spearville, 50-20, and beat Satanta (42-36) and WaKeeney-Trego (28-20). Ingalls has passed for 175 yards and rushed for 151 yards a contest. Sophomore Josh Irsik has rushed 42 times for 301 yards. Fowler (2-2, 0-0 district) – The Goldbugs have passed for 202 yards and delivered 121 rushing yards a game. Senior quarterback Taylin Bird has completed 20 of 28 passes for 403 yards with a 7/2 TD/INT ratio. Fowler won the district title last season and then defeated Victoria in the first round, 17-14, en route to the program’s first playoff victory since 1984. Ashland (1-3, 0-0 district) – Ashland has three big losses and delivered a 42-8 victory in Week 3 against Minneola. The top three rushers have between 101 and 130 yards. Moscow (1-3, 0-0 district) – Moscow opened the season with three big losses before a 54-8 victory against Greeley County last week. Junior Alexis Manriquez leads Moscow with 74 carries for 452 yards and six scores. Bucklin (0-4, 0-0 district) – All four of Bucklin’s losses have come by 28 or more points. The Red Aces haven’t won a game since a 1-8 season since 2008; some 44 losses ago. Bucklin’s only postseason appearance since 1999 came in 2006.